The Green Lantern Re-launched as Gay Super-Hero!!! One of DC Comics most popular superhero has received a reboot and will be revealed as a gay man in next week’s issue of ‘Earth 2’. Over the past 70 or se years, Green Lantern has gone through many changes, whether it be Hal Jordan, Alan Scott, or John Stewart, we all welcome the change. Alan Scott, a former married father of two who first appeared in 1940 tips readers off to his sexuality early on in the comic when he gives his boyfriend a welcome home kiss. Writer, James Robinson says, “He’s very much the character he was. He’s still the pinnacle of bravery and idealism. He’s also gay.” The Emerald Guardian’s sexuality was rebooted along with the rest of his fictional universe as part of DC’s “New 52” initiative aimed at rejuvenating their characters. Robinson said he decided to make the change because making the character young again meant erasing Scott’s gay superhero son out of existence. “The only downside of his being young was we lose his son, Obsidian, who’s gay. 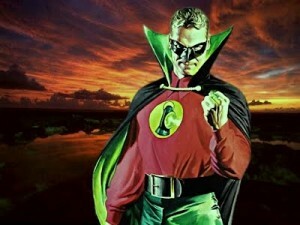 So I thought, ‘Why not make Alan Scott gay?’. “That was the seed that started it.” And DC liked the idea so much they quickly signed off on it. Be sure to get your copy next week, for it sure will be a collector’s item. I wonder if we will hear comments from Ryan Reynolds? Warner Bros. & DC Pushing ‘Green Lantern Corps’ Film With David Goyer!!! Warner Bros. Announces 10 DC Movies, 3 LEGO Films and 3 ‘Harry Potter’ Spin-Offs!! Michael Clark Duncan Will Voice “Kilowog” In The Green Lantern!!!! This entry was posted on Friday, June 1st, 2012 at 11:41 am	and is filed under Comics, News. You can follow any responses to this entry through the RSS 2.0 feed. You can skip to the end and leave a response. Pinging is currently not allowed. « ‘True Blood’ Casts Tina Majorino!! !